Preheat oven to 400°F./ 204°C. Place salmon on foil-lined baking pan. Meanwhile, mix pomegranate juice, sugar, and vinegar in pan and bring to a boil. Boil 8 to 10 minutes or until reduced to about 1/3 cup. Spoon sauce over salmon to serve. 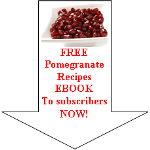 Read enough about baked salmon recipe and want to discover more pomegranate recipes?